Savor California's inaugural event featured a fabulous display to illustrate the wide variety of products showcased on the website. Nana Mae's Organic Apple Juice was served at the booth. Twenty of Savor California’s Marketing Partners took advantage of the opportunity to offer tastes of their products to members of La Chaîne des Rôtisseurs and L’Ordre Mondial. 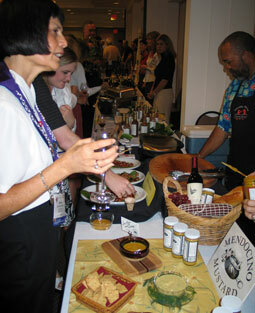 Forty elite wineries were also invited to be part of the tasting. The occasion was a four-day national gathering to celebrate food, wine and conviviality, and the guests came from all over the United States. 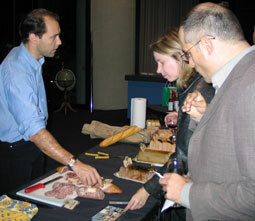 Members of La Chaîne des Rôtisseurs and L’Ordre Mondial enjoy samples of Sonoma Sausage and Mendocino Mustard. Food and wine pairing is an oft-used euphemism for Chardonnay with fish and Cabernet with meat, but there are so many more tasty options. Attendees were encouraged to experiment with tastes and pairings presented by gourmet specialty food producers, small wineries and micro-breweries: Savor the flavors, throw out the rulebook and do their own thing. Cooks, vintners, gardeners and those who just like to eat and drink well, were invited to wander in Copia’s blossoming Edible Gardens and to savor specialties made by gourmet food producers and fine restaurants. Copia is a cultural center and museum whose mission is to investigate and celebrate the culture of the collective table through wine, food and the arts. Last year was a highly successful first time for this event. The coordinator is Clark Wolf, who has very valuable connections in food and media circles. 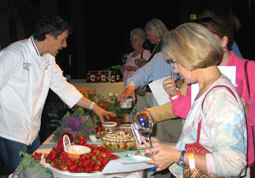 The producers who participated in the Savor California booth in 2004 found it to be exceptionally worthwhile. They were Bovine Bakery, Brickmaiden Bread, Cheesecake Momma, McCray Ridge Winery, Mendocino Mustard, Skipstone Ranch and Spring Hill Jersey Cheese. 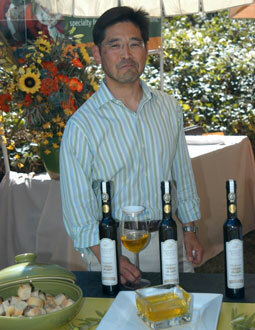 Cal Uchida with bottles of the award-winning Skipstone Ranch Extra Virgin Olive Oil. Attendees were invited to sample gourmet treats that make delicious party fare with little or no preparation, experiment with combinations that are easy and fun, and discover tasty gift ideas. The Interactive Panel Discussion offered suggestions from the pros on organizing a party, stocking a kitchen with essential equipment, pantry items and wines, as well as presentation tips to personalize entertaining. Sébastien Espinasse serves French artisanal charcuterie made by Fabrique Délices.